Family life, especially for those with children at home, can be a noisy, stress-filled existence riddled with schedules, waiting, traffic and responsibilities. If you want your reunion to be the antithesis of this, rule out Las Vegas, theme parks, crowded resorts and big cities. Consider, instead, the favorite digs of belted kingfishers, 40+ inch muskies, black bear, ruffed grouse and friendly, hard-working folks with lots of spirit: the Northwoods of northwestern Wisconsin. The Hayward Lakes area and, about 20 miles to the north, the Cable area, remain unspoiled and tranquil despite the fact that more people are learning about this nook of natural beauty. Anchored by the 850,000-acre Chequamegon National Forest, the region offers unparalleled outdoor recreation with 200 glaciated lakes and rivers and 600 miles of groomed trails, family-run resorts, fifteen golf courses, gaming, fine Northwoods dining and one heck of an autumn blast of color. Some of the lakes have 10-mph speed limits, adding to the peacefulness, while others are sanctuaries for fish and wildlife. At various times of year, the sleepy hamlets burst with activity and sports enthusiasts. Skiers arrive the last Saturday in February for the annual American Bierkenbeiner Ski Race and Cable’s Chequamegon Fat Tire Festival attracts 2,500 mountain bikers a few weeks after Labor Day. Summer’s Musky Festival reminds tourists that Hayward is the home of world record muskies. An autumn reunion in the Cable/Hayward region promises cooler, crisp air amid spectacular foliage, perfect for easy to challenging hikes. (Peak color times are usually the last week in September through the first weeks in October.) Families with little ones may choose nature trails that feature interpretive stations that can be experienced in as little as minutes. Copper Falls State Park is a family favorite with well-graded trails and three waterfalls. If you’d rather drive, three self-guided, marked and mapped fall colors tours are available at the Cable Area Visitors Center. Or you can canoe the Namakagon River, part of the St. Croix National Scenic Riverway, to snap photos of wildlife and listen to the calls of a myriad of birds. Golfers experience nirvana when they hear there are 16 golf courses within an hour’s drive or less from the reunion site. Courses range from family-friendly par threes to 18-hole championship varieties such as Forest Ridges Golf Course at Lakewoods Resort, just east of Cable. The lush Chequamegon National Forest surrounds the course, so don’t be surprised if you must wait for a family of white-tailed deer to cross before taking your next swing. With the area’s only on-cart G.P.S. system, Forest Ridges has a complete pro shop, driving range, bar and grill and teaching center. In its fourth generation of family operation, the Lakewoods Resort staff works overtime to create unique reunions with many activities right outside the door on 3,400-acre Lake Namakagon. The full-service marina offers water bikes, pontoon and paddleboats, canoes, kayaks and water skis. Trophy walleye, northern, bass and panfish are some of the treasures awaiting fishing fans and the lake regularly produces 40+ inch muskies. Lakewoods will arrange fishing guides for both beginners and serious anglers. It’s a good thing Lakewoods rents bikes: there are over three hundred miles of mapped and marked trails in the area, extending from Hayward to Iron River, following a variety of paths from ski trails to logging roads. If your group prefers to stick close to the resort, there are indoor and outdoor pools and tennis and volleyball courts for family competitions. The Rasmussens will do as little as booking rooms or get really involved in a reunion, arranging entertainment, speakers, comedians, doing all or some meals. “Our philosophy is to sit down with the reunion coordinator, and find out how much or how little they want our involvement,” explained Kathy Rasmussen. “We know every reunion, like every family, is different,” she continued. “If there are lots of little kids, we’ll create family activities or if the group is older, we’ll do something very different like setting up a room with cards and VCR, so they can sit and visit and be very comfortable in a quiet setting.” Using the resort’s facilities, families can schedule golf, tennis or volleyball tournaments or races with any of the non-motorized water equipment. 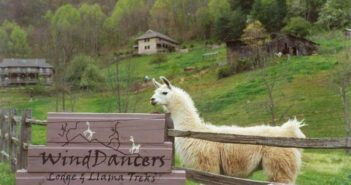 Special activities for kids may include tie-dyeing, horseback riding, paddle boat races, golf and tennis lessons. Rasmussen takes digital photos and posts them throughout the week for reunion members to view and order. 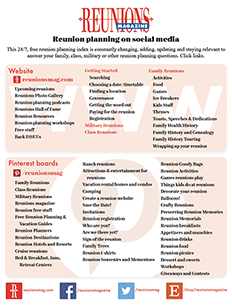 Plan a special end-of-the-week banquet to round out one terrific reunion. Of the 20 or more reunions Lakewoods hosts every year, many stay for a full week and staff arranges day trips and transportation, if necessary. The small but imaginative Cable Natural History Museum recently unveiled a terrific exhibit about the most dominant group of creatures on the planet — insects. Anglers must visit Hayward, home of the colossal musky that doubles as the National Fresh Water Fishing Hall of Fame. There are rooms full of outboard motors, trophy fish and antique lures and everyone should have their picture taken while in the mouth of the 4 story mad musky. The “Wilderness Walk” is a combination Western Town and zoo that’s fun to stroll and don’t leave without taking in Fred Scheer’s Lumberjack Show. The lumberjacks are young athletes who compete in speed climbing, log rolling, canoe jousting, sawing and axe throwing. A stop at Tremblay’s Sweet Shop, for homemade fudge and peanut brittle, is a must. Try your luck at any of the four casinos within 45 minutes of Lakewoods. Lac Courtes Oreilles Casino is just 4 miles east of Hayward. About an hour’s drive from Lakewoods, the Apostle Islands National Lakeshore in Bayfield makes for a wonderful day trip. Choose a cruise to see some or all of the 22 Apostle Islands and their much-photographed lighthouses. Eagles, loons and seagulls complete the picture. Lakewoods Resort can arrange to have a private cookout ready for you on return from Bayfield. The O’Keefe’s of St. Paul, Minnesota, prefer to stick around Lakewoods during their every-other-year reunions. “The food is excellent, boats are available and the live music on weekends is fun,” laughed Elizabeth, who with her husband Robert celebrated their 50th wedding anniversary at the resort two years ago. “Some may go to one of the casinos, but mostly we talk and have meals together and catch up.” The O’Keefe reunion, about 60-70 strong with kin from Arizona, Illinois, Alabama, the Dakotas, Minnesota and California converge on this northwestern Wisconsin community. “The family talks about changing venues, but we always come back to Lakewoods and it has become a wonderful tradition,” said the O’Keefes. Contact Lakewoods to work out a reunion package in the glorious Northwoods of Wisconsin. Contact 800-255-5937; www.lakewoodsresort.com.